Snow in Rome this week ! Romans bewildered by their city’s first big snowfall in 26 years used government-issured shovels to clear sidewalks and piazzas, and kitchen utensils to clear windshields on Saturday, Feb. 4, 2012. The snow was as deep as 8 inches in some neighborhoods, according to the Associated Press reports, and shut down tourist sites such as the Colosseum. 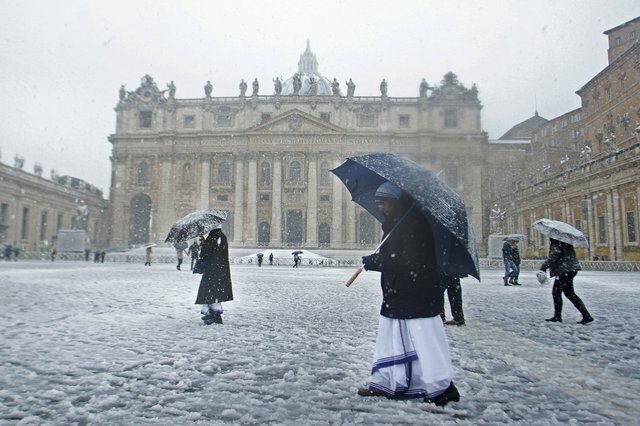 Vatican City, Rome, Italy – A nun of the Missionaries of Charity shelters from the snow with an umbrella as she walks through St. Peter’s Square in Rome on Friday.